Prunes are a concentrated fruit. 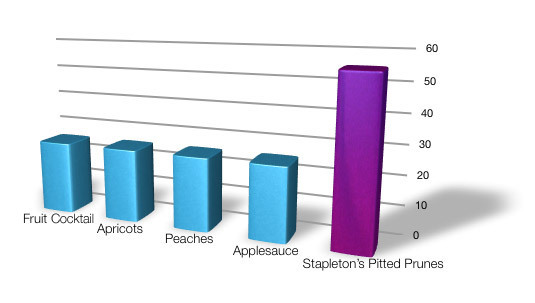 Using the American Dietetic Association Fruit Exchange guidelines, 3 #10 cans of Stapleton's Prunes in Juice have more Fruit Exchanges than 6 #10 cans of Fruit Cocktail, Apricots, Peaches, Pears and Applesauce. In other words, prunes have two fruit exchanges per 4 ounce serving. At first glance, canned prunes look to be twice as expensive as other canned fruit. But since there are twice as many servings per can as other canned fruit, the cost per serving is actually equivalent to other canned fruit. A serving of prunes costs roughly $.27, virtually the same cost per serving as canned peaches or fruit cocktail. 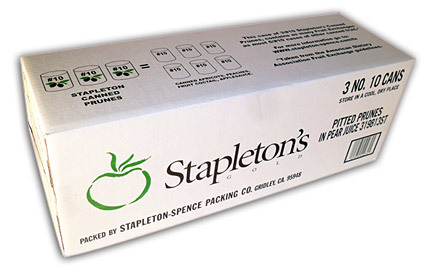 Stapleton's 3 - #10 case of Prunes (Dried Pitted Plums) in Juice Fruit Exchanges per #10 Can Modified by The Mayo Clinic with permission from "Choose Your Foods: Exchange Lists for Diabetes," which is the basis of a meal planning system. ©2008 American Diabetes Association and American Dietetic Association. Shelf life of 24 months when stored in a cool dry environment. Prunes are a delicious and easy addition to so many recipes. Add canned pitted plums (with their liquid) to your favorite stewed or sautèed pork or poultry recipes. Instant Elegance and Richness! *Low fat baking - Blend canned pitted prunes with their liquid into a puree. Cut 1/2 the fat from your favorite cake or muffin recipe and substitute with canned prune puree. Now you have a lower fat, moist product. Simple and delicious! *An elegant dessert. Add 1 tablespoon brown sugar to each serving of canned whole prunes. Heat, flambè with your favorite brandy, cognac or liqueur and you have an elegant dessert. Serve over ice cream and it's even better! Canned pitted prunes are perfect as a sauce or smoothie base, classic with poultry and a champion in baked products. Add to that their enormous popularity at the buffet table (so it's always available in the kitchen), ease of use and low cost and you have a great all around ingredient to give that special touch to your menu.